See you next year, guys. 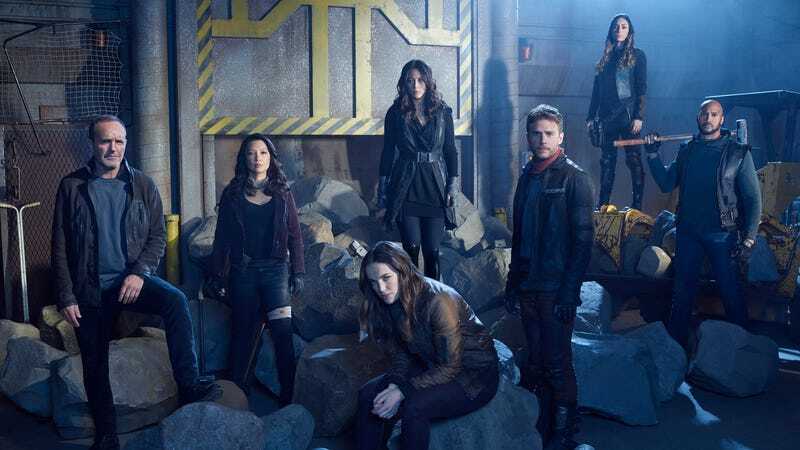 First, the great news: Marvel’s Agents Of S.H.I.E.L.D. will be back for a sixth season. The perpetually on-the-bubble show rallied and overcame adversity yet again, almost like some sort of group of heroic fighters would or something, and will return to save the world anew. That just leaves us with one more big question. Is Thanos’ finger-snap heard ’round the world going to wipe out half of our team? Or even, you know, a third of them? We asked this question two weeks ago, when the series first acknowledged that it was still in the same timeline with the big-screen MCU, by acknowledging that the fight in New York which kicks off Infinity War was currently underway. Presumably, that means Thanos will acquire all the Infinity Stones and make his move in the season finale, unless the show punts on having that happen until next season’s premiere. Regardless, either Agents Of S.H.I.E.L.D. is going to have to do an entire season with a big chunk of its cast absent for reasons having nothing to do with the show’s creative team—which would be a huge bummer—or it’ll have to figure out some way to bypass the obliteration of half of the team, perhaps by continuing to mess around with time, the way season five has done to sometimes uneven results. Either way, we’re thrilled it’s coming back. The show hit its creative peak last year, and it would be a shame to lose a show so clearly in the middle of its most inventive and strong run. Pretty impressive for a Marvel show whose first season made Iron Fist look acceptable.